Black Diamond's 2-ounce Gizmo hits a fine balance between output and weight. 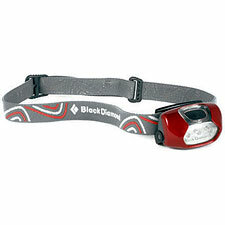 This is the headlamp I carried when I climbed and skied Mount Tyndall. I spent a long eight hours with the Gizmo, on trail and then off, ascending steep snowfields in the dark on a formidable 19-hour push. Overall I came away very impressed with the Gizmo's performance. This isn't a high-octane floodlight for midnight climbers on first ascents, but if you just want a bright, soft, ample beam to keep you on-route, the Gizmo gets the job done with ease. The Gizmo burns a long 30 hours on high, powered by two AAA batteries. Features include a tiltable housing, a low-beam, which pushes the burn up to 72 hours, a strobe mode, a safety on the power switch to prevent the unit from accidentaly going on, and an auto-off. The Gizmo's output is robust enough to make it an outstanding backup for your primary light—or just carry it on its own as your main light. When you don't need it, the Gizmo's small size and light weight make it hardly noticeable whether you keep in your pack or your pocket. Black Diamond says the Gizmo is water-resistant. If climbing in heavy rain is a possibility, you'll likely want to pick a fully waterproof headlamp. For most other situations, including general backpacking and camping, I think the Gizmo is ideal. I like that it runs on easy-to-find AAA batteries. Note that you can burn lithium batteries to save weight if you choose, but you'll need to be careful as these can run hot and damage the unit over time. Compared to Petzl's Tikka, the Gizmo is lighter and slightly smaller. The revised Gizmo burn time is impressive, as is light output. I prefer the Gizmo's housing, as it seems easier to angle the light where I want it. At half the cost, the Gizmo is definitely the more economical choice.